With the growing popularity over the past few years, the Ys series has crossed over to other games in different forms. These are all 100% official and appear in both Japan and North America. 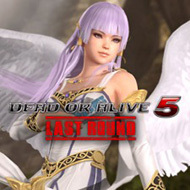 In 2015, Dead or Alive introduced a bunch of collaborative costumes from various Falcom games including The Legend of Heroes, Brandish and Ys. 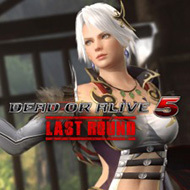 This incredibly pricy DLC pack ($34 USD for 16 costumes) is available for PlayStation 3, 4, Personal Computers and XBOX platforms. The costumes are $3 when purchased individually. The images below are of Reah, Feena and Zava costumes. The Neptunia series is a JRPG parody of the gaming industry with characters representing consoles and gaming companies. In fact, the world itself is called the Gamindustri and the four goddesses (representing PlayStation, Nintendo, Xbox and Sega) are in a battle known as the Console War. One such character is Falcom who appears in the main series and playable via paid DLC (PS3 versions). 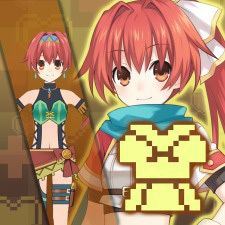 Her younger costume bears a similar resemblance to Adol Christin while The Legend of Heroes inspires her older costume. She has incredibly bad luck with oceans where she is often involved in shipwrecks. Furthermore, an additional DLC gives her Karna's costume from Ys: Memories of Celceta. 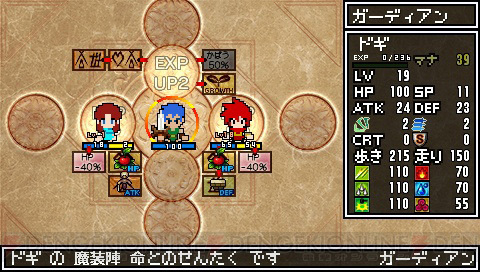 The Legend of Heroes is another flagship series by Nihon Falcom. 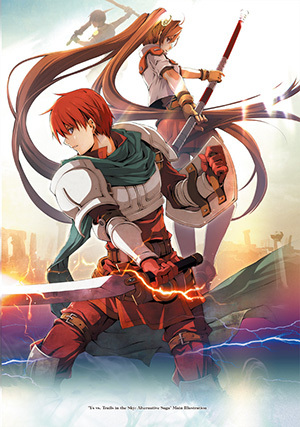 It shares no relation to the Ys series and is steadily gaining popularity outside of Japan. 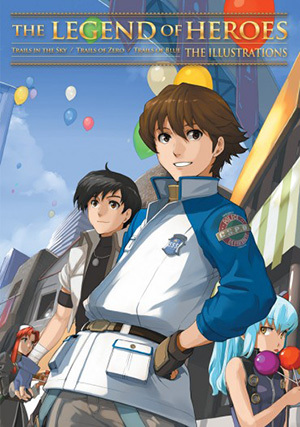 Bandai localized the Gagharv trilogy for the PSP between 2005-2007. If you observe the back of The Legend of Heroes: Tear of Vermillion case, you'll notice that Ys is mentioned just above the Falcom logo. 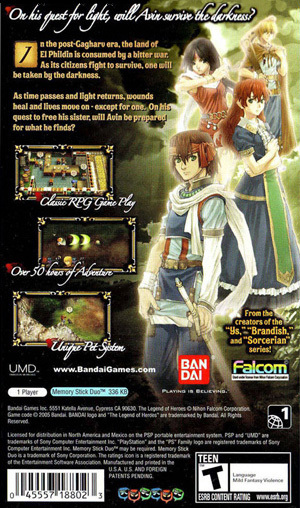 As Ys gained even more popularity, "From the creators of The Legendary Ys" is mentioned in big bold text on the back of The Legend of Heroes: Song of the Ocean. 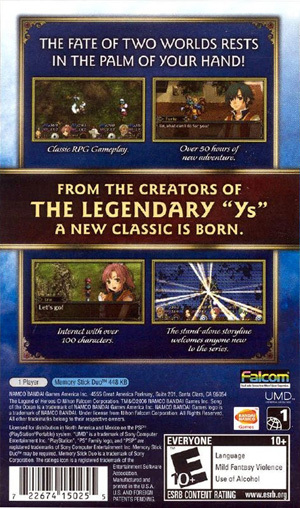 In Japan, Falcom developed a cross-over fighting game called Ys vs Trails in the Sky: Alternative Saga. It was never officially localized outside of Japan. However, the art is included in the "Trails In The Sky: The Illustrations" book. 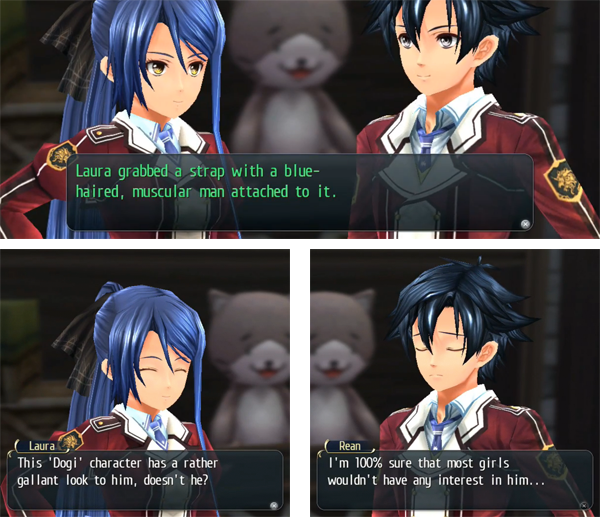 During Chapter 3 of The Legend of Heroes: Trails of Cold Steel, Rean and Laura go shopping. We'll let the following screenshots speak for themselves. 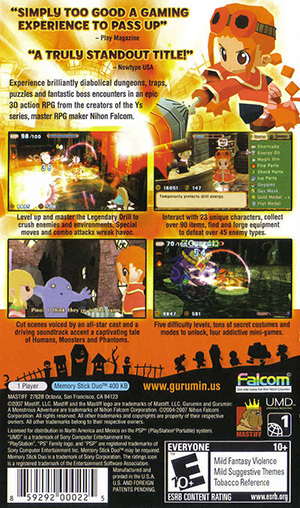 Gurumin is another Action RPG by Nihon Falcom. It shares no relation to the Ys series and is an incredibly obscure title that's not well-known in North America. If you observe the back of the PSP case, you'll notice that Ys is mentioned in the first paragraph, "from the creators of the Ys series". 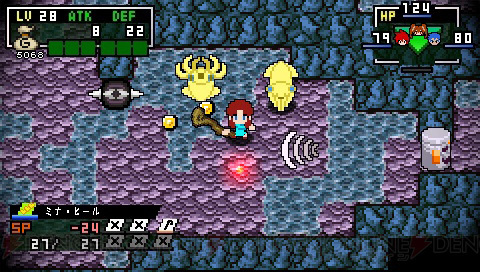 ClaDun (short for Classic Dungeon) is an Action RPG developed by NIS and localized by NIS America, available on PlayStation and PC platforms. 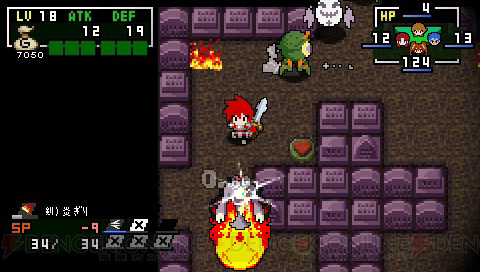 ClaDun X2 (the second game in the series) has a character creation mode that lets you create your own sprites, animations, name, gender and class to play. In Japan, NIS partnered with Nihon Falcom to bring official character templates for Adol, Dogi and Lilia. 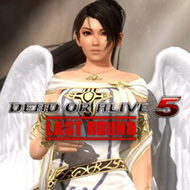 Although this partnership was never officially promoted outside of Japan, the character creation tool gave fans the equal opportunity to include these characters in their game. 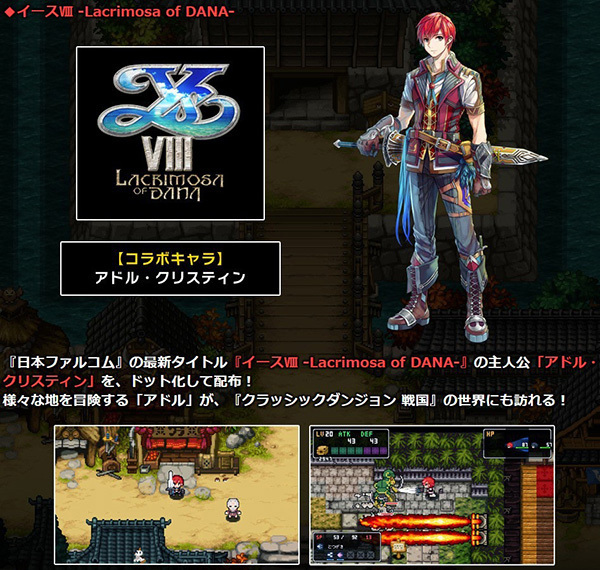 NIS and Falcom collaborated again with the newly released ClaDun Returns in Japan, bringing Adol Christin from Ys VIII Lacrimosa of Dana into the game. 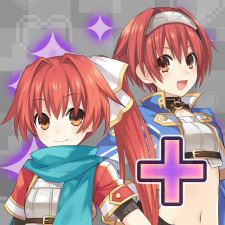 No official announcement has been made for this partnership to continue outside of Japan, but with a character creation mode similar to ClaDun X2, we can only assume that Adol's template will be available to us as well. 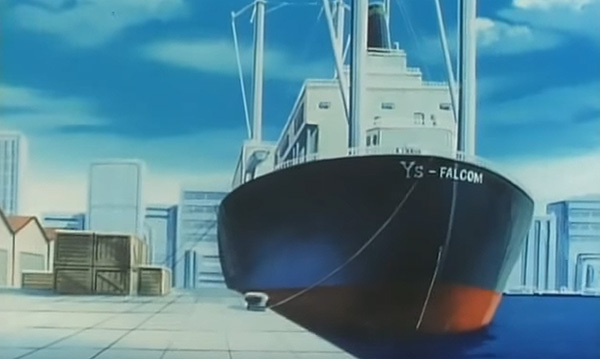 Episodes 50 and 51 of the City Hunter anime takes place on a boat called Ys - Falcom. 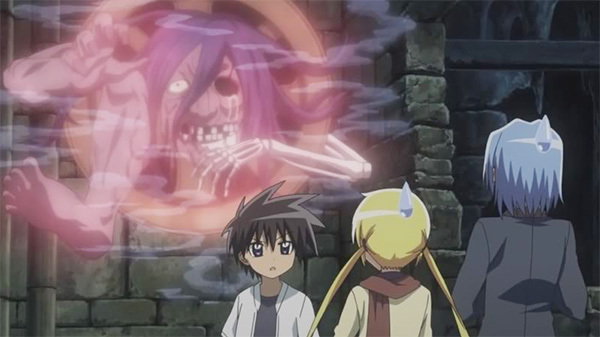 In Episode 3, Season 2 of Hayate the Combat Butler, Hayate becomes poisoned by a dungeon trap. To cure him, Nagi and Wataru go off to find a Celceta Flower that's kept at the deepest part of the dungeon. As a direct reference to Ys II and Memories of Celceta, the flower can cure the most incurable diseases.